A beautiful two tone solid brass urn with silver engraved flowers It comes with a threaded lid and felt bottom. A beautiful velvet bag is also included with the large urn purchase. Height: 10.5" Width: 7" CU. Inches: 220 The urn can be personalized for no extra charge. Please select the option to customize the product before adding it to cart. Screw on top lid and felt lined base. 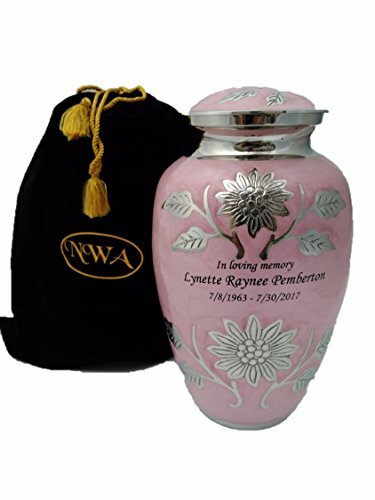 The urn can be personalized for no extra charge. Please select the option to customize the product before adding it to cart. If you don't want it engraved, simply say "no engraving" in the text box.